Alan Lipman, DVM, DACVR, discusses radiographs taken on a patient brought to the hospital for collapsing. Can you determine the diagnosis? 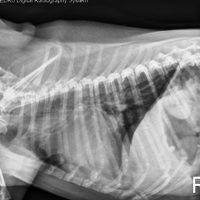 A 12-year-old female spayed Chihuahua presented to DoveLewis for collapse and dyspnea. She had been treated for the last eight months for heart disease attributed primarily to mitral insufficiency / degenerative valvular disease. Initial thoracic radiographs (not provided) demonstrated moderate cardiomegaly with left atrial enlargement. Moderate alveolar infiltrate involving caudal lung fields was most consistent with cardiogenic pulmonary edema. There were also several visible pleural fissure lines bilaterally which may reflect a scant quantity of effusion or pleural thickening. No other radiographic changes were identified on the initial study. Cardiac consultation and echocardiography demonstrated mitral insufficiency and pulmonary hypertension. Treatment for heart failure was instituted which resulted in incomplete resolution of coughing. Follow-up radiographs of the thorax were performed three days later to re-evaluate for cause of continued coughing. Follow-up radiographs demonstrate persistent moderate cardiomegaly with left atrial enlargement. Pulmonary arteries and veins are not distended. Alveolar infiltrate involving the caudal lung fields is no longer visible, consistent with resolution of pulmonary edema. Several persistent pleural fissure lines are identified which again may reflect a scant quantity of pleural effusion. There is severe collapse of the entire intrathoracic trachea which was not present on the prior study. No other radiographic changes are identified. Tracheal collapse typically results from a lack of structural integrity of the trachea, typically seen in toy or small breed patients. Collapse of the intrathoracic trachea is usually seen during the expiratory phase of respiration while cervical tracheal collapse is seen primarily during inspiration. Making lateral projections in the inspiratory and expiratory phase is recommended. Eliciting a cough with tracheal manipulation before making radiographs may also be useful to increase the diagnostic yield of the procedure. Fluoroscopic evaluation of the trachea during coughing events may be useful if radiographic studies are otherwise equivocal.